Heavy Duty, Non-slip work shop matting. 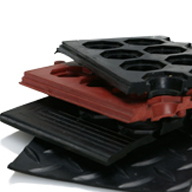 Single mats, or interlocking available. Sheeting Diamond Checker Plate Rubber Flooring. Ideal applications include Carpet Protection, Floor covering in vans, Custom car mats, Car boot liners, Bench Covering, Tool box/ Trolley lining, Gym matting, Car flooring and more. Supplied by the metre.